The 2019 INFINITI Q70 is an elegant and sporty sedan that offers two powerful engines and a signature all-wheel drive. Equipped with the Safety Shield technology, this premium car carries more than 10 active safety features. An 8.0-inch infotainment system with the InTouch platform is available in the 2019 Q70. The 2019 INFINITI Q70 offers a 3.7 L V6 engine that has a peak output of 330 horsepower and 270 pound-feet. Engineered for aggressive performance, the 5.6 L V8 engine whips out 420 hp and 417 lb-ft. Every lift of the valvetrain is managed by the patented VVEL technology. A seven-speed automatic transmission system is standard in the Q70. After several trips, the Adaptive Shift Control technology will memorize your personal preferences for gear combinations. You could also select multiple manual modes and the Downshift Rev Matching. When equipped with the all-new Eco Pedal, this INFINITI conserves precious fuel. The Drive Mode Selector gives you extra options for smooth handling on various terrains and under different weather conditions. Additionally, this premium sedan has the Intelligent All-Wheel Drive that controls traction in the front and rear wheels. The genuine leather seats in the 2019 INFINITI Q70 are available with semi-aniline and pipe stitching. Aluminum pedals and solid magnesium paddle shifters accentuate the sporty design of the cockpit. This lavish sedan is also outfitted with Japanese Ash wood and a stitched hood on some of the gauge meters. A suede-like headliner is available in select trims. Linked to the electronic Intelligent Key, a memory system stores several positions for the driver’s seat, exterior side mirrors and steering wheel. In addition to boasting high-end materials, the 2019 Q70 offers next-generation technology. The InTouch infotainment system includes an 8.0-inch WVGA monitor with touch-screen menus. You can view directions on colored 3-D maps with terrains and urban landmarks. Dozens of applications are accessible in the InTouch suite, including concierge services and emergency assistance. The 2019 INFINITI Q70 is equipped with forward-facing sensors that predict hazardous situations. You’ll receive clear alerts from the Predictive Forward Collision Warning if there’s a high threat of a crash. The front and rear brakes might be automatically engaged to avoid an accident. Lane-monitoring sensors and cameras also analyze the risk level of a side collision. The Blind Spot Warning is a traditional active safety feature that’s also available. Some new driving aides that are installed in the 2019 Q70 include the Distance Control Assist and Brake Assist with Preview. 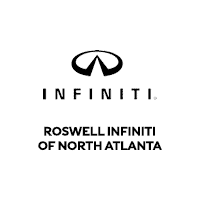 Roswell INFINITI is a great venue for a test drive in the 2019 INFINITI Q70. We invite you to take the 3.7 Luxe and 5.6 Luxe models for a fun ride at our dealership.